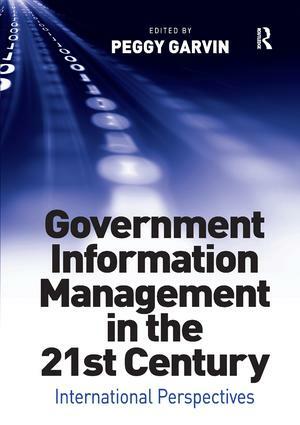 Government Information Management in the 21st Century provides librarians, information professionals, and government information policy leaders with a comprehensive and authoritative state-of-the-art review of current issues in government information management with a global perspective. The widespread use of the Internet to provide government information and services has altered the landscape dramatically for those who organize, store, and provide access to government content. Technical challenges include digital preservation, authentication, security, and accessibility for a diverse user base. Management challenges include changes to costs, workflow, staff skills and resources, and user expectations. Public policies based on distributed paper collections must also change to address issues that are inherent to digital, networked, public content; such issues include the maintenance of personal privacy, re-use of government information, and the digital divide. The authors in this timely book are practitioners, scholars, and government officials. Together they provide an informed look at how managing government information is being tested at a time of rapid change. Part I addresses key issues for public, academic, and government libraries in organizing and providing access to government information. Part II features chapters on the diverse information issues facing governments, such as managing Freedom of Information requirements, opening government data to the public, and deploying new online technologies.